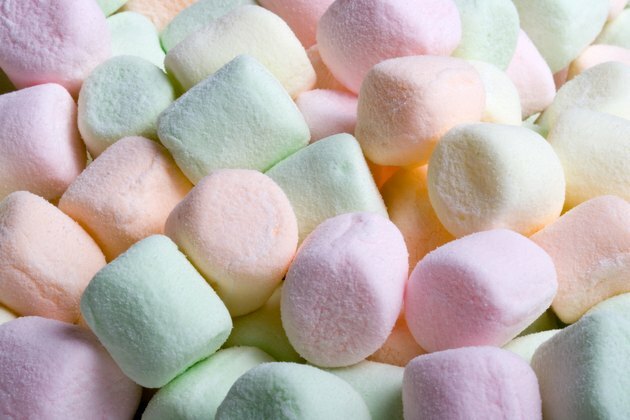 Why Don't Vegetarians Eat Marshmallows? Vegetarian diets range from vegan, which eliminate all animal-based products, to pesco- and pollo-vegetarian diets, which include fish and poultry, respectively. Other variations accommodate eggs, dairy products or both, but omit any type of meat, poultry or fish. Marshmallows, however, typically contain an ingredient made from an animal product that is generally off limits for any type of vegetarian diet. Gelatin, a common ingredient in gummy candy, yogurt and ice cream, is also used to make marshmallows. It is an animal protein, derived on a commercial scale in the United States. It comes primarily from pigskins and the bones and hides of cattle with a very small percentage coming from fish bones and skin, according to the Vegetarian Resource Group website. With the exception of gelatin specifically attributed to non-animal sources, such as agar and carrageenan, kosher gelatin can be made with fish bones, and/or beef or pork skins, notes the Vegetarian Resource Group website, explaining that Kosher law is very complex and that the bones and hides used in Kosher gelatin production are typically considered pareve. It is also generally considered kosher to use kosher gelatin with dairy products. Although marshmallows typically contain the non-vegetarian ingredient gelatin, vegetarian marshmallows are available. Read the ingredient list and look for products that are labeled as vegetarian or vegan. Check with the manufacturer if you are uncertain about the ingredients. Another option is to make your own, using agar. Other products with gelatin as a common ingredient include some dairy products like sour cream, yogurt and ice cream, dessert products like puddings, as well as medicine tablets and capsules, according to the Gelatin Manufacturers Institute of America website. As is the case with marshmallows, cheese containing rennet is also of concern for vegetarians. Rennet, made from the fourth stomach of calves, renders several cheese varieties non-vegetarian, according to the Vegetarian Resource Group website.